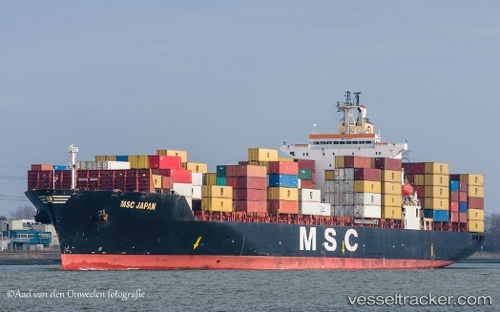 On May 26, 2015, the "MSC Japan" was involved in an SAR operation off Penmarc'h. At 8.55 p.m. the CROSS Etel had been alerted by the crew of the21-m-gillnetter "Ge Mi Ma", 50 gt (MMSI-No. : 228341000),from Bayonne. The vessel had suffered water ingress 160 miles off Penmarc'h. The CROSS immediately alerted a Cayman helicopter of the Naval aviation base Lanvéoc and reported the distress situation to nearby vessels. The MRCC Madrid sent an EC225 helicopter of SASEMAR in La Coruña. Both helicopters were operating at the limit of their range and their work on site was thus limited to about ten minutes. The only option was to winch immediately the nine crew members of "Ge Mi Na" with the two helicopters operating successively. A Falcon 50 of the Naval Aviation base Lann-Bihoué was mobilized to coordinate and guide the two helicopters. The Caiman was able to hoist five crew members before leaving the area at 11:25 p.m., the EC225 hosted one man. The three remaining crew members were forced to seek refuge in their liferaft. They were taken aboard the "MSC Japan", which was coming from Sines and had proceeded to the position of the "Ge Mi Na" thanks to the distress relay issued by the CROSS. Finally five Portuguese sailors were landed at Lanvéoc, another Portuguese sailor was evacuated by the EC225, and a French sailor and two Spanish sailors were en route to Rotterdam aboard the "MSC Japan".